Top Ten Ways that Going to the Doctor in Colombia is Different than in the U.S. | Barranquilla or Bust! Top Ten Ways that Going to the Doctor in Colombia is Different than in the U.S.
No waiting in the exam room! The doctor’s personal office and the exam room are one and the same (it looks a little like a Norman Rockwell painting), so once you’re in – you’re in! But just like in the U.S., you may have to wait forever in the main waiting room. Some doctor’s offices in Colombia actually abide by appointment times; others ignore them completely. The first pediatrician to whom we took our son Marcello (we’ve since gotten rid of him – the pediatrician, that is, not Marcello) would give us an appointment time, but then he saw people on a first-come, first-served basis. Since everyone seemed in on this but us, everyone else arrived at 7:30 a.m., meaning that our 10:30 a.m. appointment was happening around 2:00 p.m. Ugh. Health insurance is cheaper – a LOT cheaper. My husband and I are both self-employed, just as we were in the U.S., so this is a huge relief. For our family of three, top of the line private health insurance in Colombia costs less than 1/3 of what we paid in the U.S. Making it even better, our co-pays for doctor’s visits are roughly $13, even for specialists – plus lots of services are covered here that are not covered in the U.S.
You are the keeper of your records. Some doctor’s offices maintain a bit of your medical information on file, but most of the time it’s up to you to hang on to important documents and bring them with you when you visit. One doctor made a sketch of my husband’s ear on the back of the prescription he wrote for my husband (more on prescriptions in a minute), and then told him to bring the sketch back for his next visit. I figure this is no different than in the U.S., except that it’s up to you to bring the sketch back. Most lab work is done off-site, so when the doctor needs tests, she orders them and you go get them – literally. An example of a commonly seen zip-lock bag containing an x-ray film. 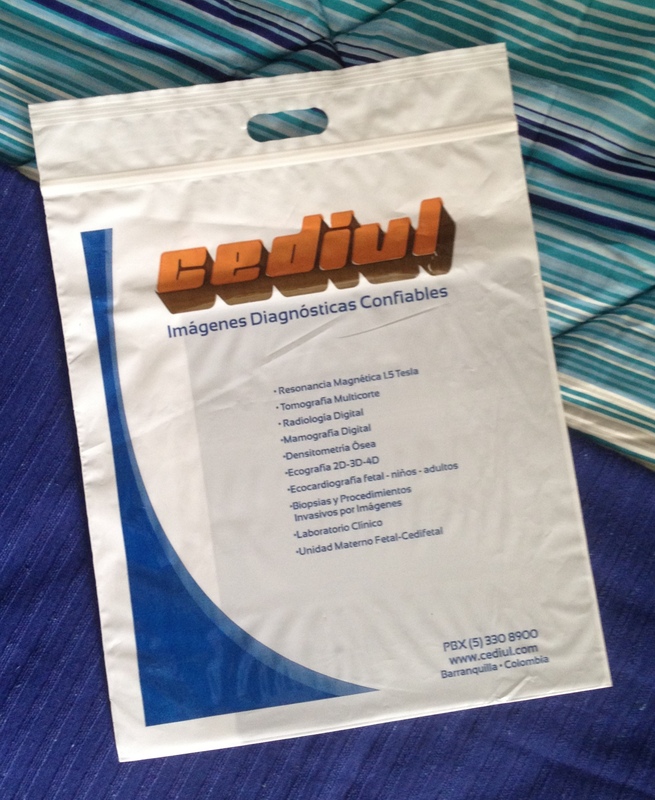 Since results are not often shared electronically, people end up walking from office to office with zip-lock bags containing documents with the results. You show them to the doctor and then take them home with you to add to your file. Doctors write hard-copy prescriptions, which they sign and stamp with their official stamp. But the pharmacy never asks for the paper. No one seems to ask for the paper. You call the pharmacy, tell them what you need, and they give it to you. Maybe this isn’t true for prescription painkillers. Maybe heavy stuff like that is more regulated. I don’t know. Speaking of prescription medicines, they don’t usually come with a pamphlet of information listing side effects or warnings, and they don’t have typed-up instructions on the side. The paper prescription that the doctor writes – the one that no one looks at but you – includes instructions for taking the medication (e.g., one pill twice a day for 10 days). But hopefully you paid good attention when the doctor went over this during your visit, because doctors here seem to suffer from the same handwriting issues as doctors in the U.S. Shots are popular. Really popular. My husband and I are healthy people, and we have been prescribed shots for minor health issues probably no less than three times in the last several months. I think the shot is usually for some medicine that would have been prescribed in pill form in the U.S. When you call up the pharmacy, they will send someone to your house to give you the shot. No kidding. Pharmacies are open 24 hours and they will deliver ‘round the clock for like $2.50. 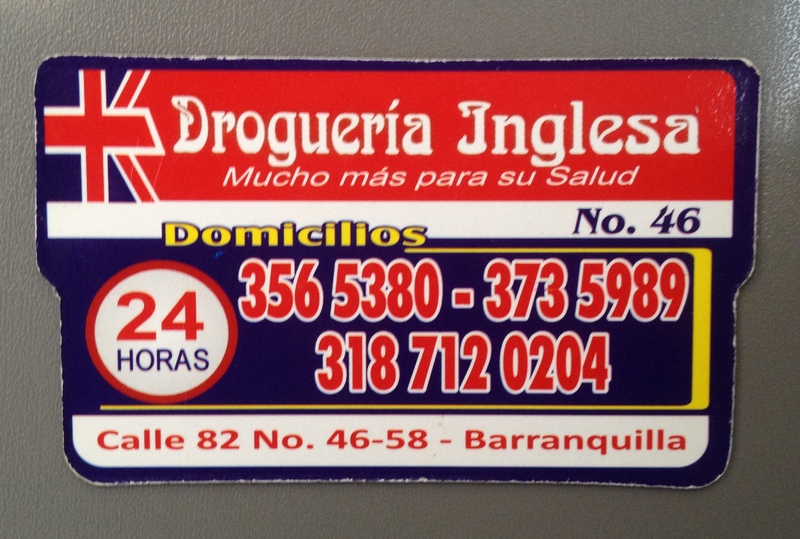 This refrigerator magnet shows that this pharmacy is open 24 hours and does “domicilios,” a.k.a. deliveries. Holy cow. No more standing in the Walgreen’s line. Not as much stuff in the doctor’s office is disposable as in the U.S. For example, in the U.S., you might be given a paper gown to put on or a paper sheet to cover yourself. In Colombia, these would probably be fabric. The same goes for the cover that’s on the exam table, if the exam table isn’t just cleaned instead of being covered. Depending on your point of view, this could be good or bad. There’s less waste, but more of a need for blind faith that the doctor’s office is keeping everything clean. During regular business hours, you can have a doctor come see you at home. Say what?! That’s right – house calls! I didn’t think they still existed. And for the same $13 co-pay. I am down with that. Do you live outside your home country? What has surprised you about getting the health care you need? This entry was posted in Daily Life, Health and tagged adventure, barranquilla, Colombia, doctor's office, expat, health insurance, pharmacy, prescriptions, south america, travel. Bookmark the permalink. Really interesting article. I’ve heard that it’s more Colombian culture to have things done inside the home (spray tans, massages, etc. ), but I didn’t realize that you could get a doctor to make a house call or have someone come to administer a shot as well! Thanks for your comment! Yes, you can have just about any product or service delivered here in Barranquilla… I think the challenge for someone new here is figuring out where to call! What is going to the doc like in Peru? Good blog. Lance Wallace posts his blogs on Pinterest. (Do you know Pinterest? Great site.) It is a really good way to increase your readership. The zip lock bags containing medical documents or for that matter any documents i.e. leases, school enrollment etc are ubiquitous in Portugal; beware of handing originals to underpaid and tired bureaucrats. Overall much better access to care for all, and less expensive drugs and specialist care as compared to the USA. House calls also exist here in Canada, but they don’t give you an exact time, just a 6 hour window.